Nathaniel PEASE III (1753- ?) was Alex’s 6th Great Grandfather; one of 128 in this generation of the Miner line. Nathaniel Pease III was born 28 DEC 1753 Enfield, CT. His parents were Nathaniel PEASE II and Sophia NICHOLS. The name of his wife is not not known. Sally, daughter of Nathaniel (Nathaniel, Nathaniel, Robert, Robert, Robert) Pease; b. Sep 01, 1782 probably in Enfield, CT; d. Jan 06, 1871 at the home of her son Selden Miner; bur. near Mayfield Center in OH; m. Nov 29, 1810, Selden Miner or Minor; b. Mar 12, 1780 in East Haddam, CT; d. Sep 08, 1842; bur. in Marlboro, CT. He was the son of Elihu Miner; b. Sep 02, 1745, and Mary Dean, a widow with two children. Elihu enlisted in the Revolutionary War May 12, 1775 in the 1st Company, Colonel Joseph Spencer’s 2nd Regiment. He served at Bunker Hill and with Arnold’s expedition to Quebec. Mary belonged to the Hadlyme Congregation Church, and Elihu was confirmed in St. Stephen’s Episcopal Church, East Haddam. 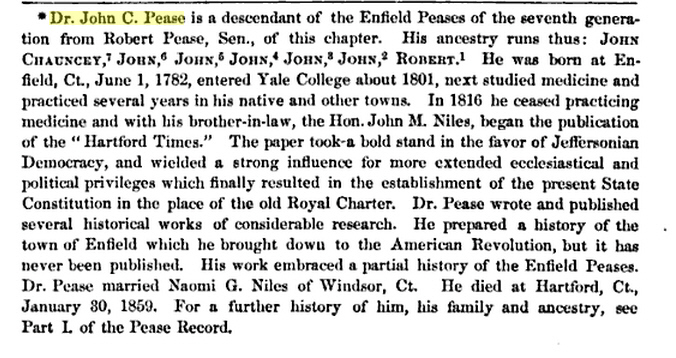 A genealogical and historical record of the descendants of John Pease, Senior by Rev. David Pease and Austin Pease 1869 (This book includes the story of Nathaniel Pease II dying at sea and includes Nathaniel Pease III b. at Enfiield December 28, 1753 History unknown. The footnote for this information refers to Dr. John C. Pease. This entry was posted in -8th Generation, Line - Miner, Missing Parents and tagged Enfield CT. Bookmark the permalink.